Depending on your taste and how much you like family, the best part of Thanksgiving is probably either the stuffing, the pie or the drinking. To balance your diverse holiday needs, FWx transformed the traditional meal into five distinct and surprisingly tasty shots suitable for Friendgivings, Wednesday night reunions and Thanksgiving pairings (for a big drinking family). We started with five favorite Thanksgiving dishes: cranberry sauce, mashed potatoes, green bean casserole, turkey with stuffing and pumpkin pie. From there, our resident mixologist Justine Sterling crafted recipes for shots based on key flavors and our least terrible ideas. After taste-testing them, we can say that they are highly shootable. We’ve never minded the jiggly cranberry sauce from a can, so here's a Jell-O shot homage. This version has way less starch than the original. Cook a stick of butter over moderate heat shaking until the butter is nutty-smelling and the foam subsides. Strain off the solids and pour them onto a plate. Rim a shot glass with the brown butter solids. Pour in vodka, garnish with potato chip and serve. For lovers of the pickleback. Pour tequila and brine into a shot glass. Garnish with green bean and serve. Leg or breast not included. Pour the seasoning onto a plate. Wet the rim of the shot glass with water (or chicken broth) and roll the edge in the poultry seasoning. Pour the rye into the glass, add the bitters and serve. Absolutely no Thanksgiving meal is complete without a pumpkin pie. Make fresh whipped cream with a cocktail shaker using Jim Meehan's technique. 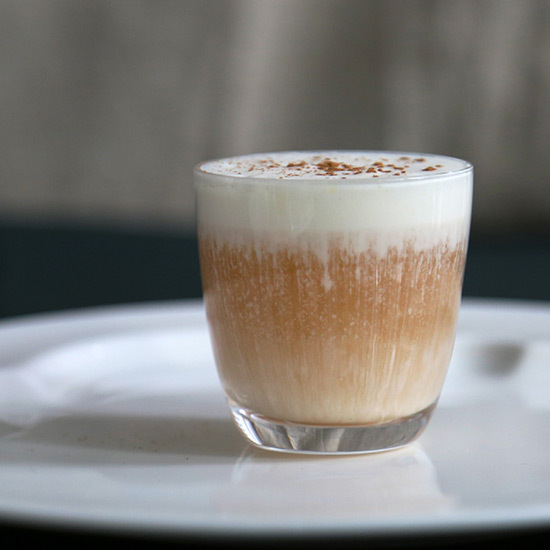 Pour rum into the shot glass and layer on whipped cream. Garnish with a sprinkling of pumpkin pie spice. Tweet your own holiday shot ideas using #FWxHoliday or share it in the comments.